Officials reveal state is advancing plans for new PA city in Samaria, under assumption increase in Arab jobs will lessen terror. Even as Arab terrorists conduct daily attacks on Israelis, the state of Israel is secretly advancing plans to build a new Palestinian Authority (PA) city in Samaria, it was revealed Monday. Security officials exposed to Walla that the security apparatus has advised in favor of establishing the city so as to create thousands of new jobs for Palestinian Arabs and improve their economy, under the apparent assumption that more money will stop the wave of terror emanating from the region and actively incited by the PA. Diplomatic sources refused to confirm to the news site whether Prime Minister Binyamin Netanyahu intends to present the plan to US President Barack Obama during their meeting on Monday, although there has been talk of new "gestures" that may be discussed in the talks. 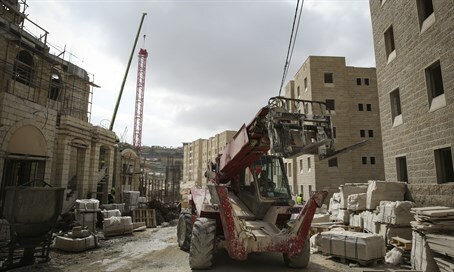 In recent years the PA has frequently demanded that an additional city be built for it aside from Rawabi, which is located between Shechem (Nablus) and Ramallah in Samaria and is currently in the final stages of construction. The new revelation is all the more surprising given the lack of Jewish construction in Judea and Samaria; in the last two coalition governments that construction has been at a record low, amid covert building freezes. Just a month and a half ago, the Lebanese paper Al-Akbar revealed an official document from meetings between senior Israeli and PA officials, according to which Israel said it was willing to build two new PA cities in Samaria aside from Rawabi. The report detailed a meeting that took place on September 9 between Coordination of Government Activities in the Territories (COGAT) chief Maj. Gen. Yoav Mordechai and PA unity government Prime Minister Rami Hamdallah, as well as the PA civilian minister Hussein Al-Sheikh. Mordechai's office responded to the report at the time by clarifying that the matter had not yet been approved. "Regarding the quote about establishing a Palestinian city in Samaria, this is a proposal of a Palestinian initiative which is currently under initial investigation and has not been approved," read the statement from his office at the time.